I don't think it has anything to do with the price. Anyway, the GPL is a real pain in the ... but it's also there for a reason and a very good one, so respecting it is the least we can do. Any risk that Mint will be thrown out from Ubuntus repositories? Please be more specific.. ?? Well, if I understand this thread (and a thread at the Ubuntu forum, http://www.ubuntuforums.org/showthread. ... =linuxmint) some people are irritated because of alleged violaitons to the GPL by Mint. Husse wrote: some people are irritated because of alleged violaitons to the GPL by Mint. Some people did never really read the GPL and hence do not understand that distributing closed-source components with a Linux distro simply is not illegal for as long as those closed-source components do not utilise GPL code in any way or form. Therefore as far as I can tell there simply are no "violations" of GPL in Mint (at least not in this context); other distributions are also shipping closed source components galore. Those accusing Mint of "GPL violations" in this context and in those postings just prove that they in fact know zipp what they are rambling about. There's a huge difference between distributing closed-source software on a CD and using GPL source code in a binary closed-source program. - extremists tend to be pissed off pretty easily anyway. - people who are serious about the GPL usually "do" read the GPL. Last edited by Husse on Tue Mar 06, 2007 5:50 am, edited 1 time in total. I consider myself somewhat of a "purist," but I don't get pissed off that easily. I think we should all work toward a world that is free of proprietary software. But that doesn't mean we can't use it in the mean time to accomplish other goals-- such as promote free software! an offer, in accord with Subsection b above.)" So if I distribute Linux Mint on a PC I sell, or via selling a CD, I have to provide access to the source myself, I can't just refer my customer to you. Which is only fair, as it is my responsibility to comply since I made the sale. By the way, thanks for the fixing those links to the source so quickly. I am a slight bit confused: surely the source should take up a bit more space... the distro is nearly 700mb... am I missing something? The Bea source code was generated with a script that calls apt-get source on each package of the manifest. If you see anything missing please tell us the name of the package and we'll fix that asap. I am not yet a Mint user, but this topic spans across distros. I must also confess my ignorance as to the contents of the GPL. I know Linus got it only to prevent others from putting his free idea under a more restrictive license and effectively killing the free software in the womb. Anyhow, the world would no doubt be a much darker place if I did not contribute my opinion on the matter As life-long anarchist I heartily disapprove of any restrictions on my personal freedom. I do not begrudge people making money, even vast sums of money. I do begrudge them making money at the point of a gun, however. 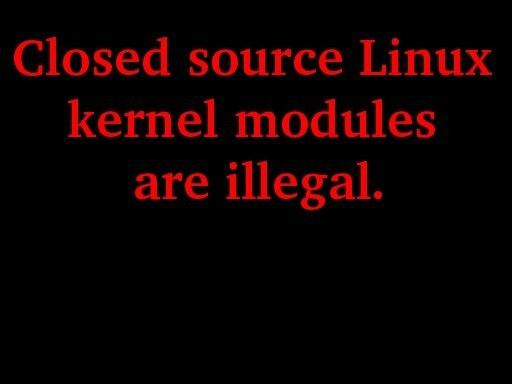 For the kernel developers to even consider making it impossible to fully utilize my computer without paying them a license fee is appalling. At this moment, the drivers for my card are available free from Nvidia, so I do not understand the conflict with the GPL. Including free software does not rob the company of income. One fine day in the distant future we will see a world free of intellectual property. For those who wonder what will inspire people to be creative in such a world I say simply "ego". Who doesn't want to be known as the creator of some fantastically popular widget? I, for one, am learning programming so I can create Linux games on par with the commercially available stuff. But, I look at it as a hobby. I have other plans to make my fortune. Until that day we are free of silly notions such as patents and copyrights I say Long Live Piracy! Wonder who held the patent on the Wheel? Good thing it's expired by now. Ah no, I'm only kidding. .. or am I ? Sasquatch wrote: I must also confess my ignorance as to the contents of the GPL. You should read it then so you really understand what is being talked about and why certain things do violate the GPL while others don't. Sasquatch wrote: I know Linus got it only to prevent others from putting his free idea under a more restrictive license and effectively killing the free software in the womb. Sasquatch wrote: For the kernel developers to even consider making it impossible to fully utilize my computer without paying them a license fee is appalling. What precisely are you talking about ???? No kernel developer I know or ever heard of ever tried that. Can you please explain? Sasquatch wrote: At this moment, the drivers for my card are available free from Nvidia, so I do not understand the conflict with the GPL. It would help if you read the license. The GPL clearly says that any code derived from GPL code must again be released under the GPL so that everyone may profit from the changes (and improvements?) added to the code. The binary Nvidia driver is linking into the GPL'd Linux kernel in order to be able to function (it cannot function otherwise). Some kernel developers see this as a GPL violation: One binary program cannot link into another binary program without taking over code (function calls, sub-routines, etc.) from each other. So one might argue that in the moment that the Nvidia driver links into the kernel it becomes derived code of code that was originally released under the GPL. But the Nvidia driver (especially the 3D part of it) is closed source and distributing it on a CD or other media would be illegal and a violation of the GPL. Hence most Linux distros cannot ship with the Nvidia driver pre-installed in any way or form ... instead you as the user have to download the driver yourself somehow. As it is assumed that you the end-user won't be "distributing" your PC installation somehow, this is regarded as "grey area" even by Torvalds himself. It's sort of legal to install and run the Nvidia driver like this on your system for as long as you don't "distribute" that somehow (which would again be a violation of the GPL). Some kernel developers are rather cool about this, others like Greg Kroah-Hartmann are rather fanatic when it comes to this. Sasquatch wrote: Including free software does not rob the company of income. Precisely because people would still buy their hardware products. Sasquatch wrote: Wonder who held the patent on the Wheel? Good thing it's expired by now. You are wrong. There is a perfectly legal patent on the wheel which is even still valid! The code that actually links to the kernel is GPL. This has never gone to court and until it goes to court and is proven one way or another, this will, as Linus himself has said, remain a gray area. Fragadelic wrote: This has never gone to court and until it goes to court and is proven one way or another, this will, as Linus himself has said, remain a gray area. Bingo! But then again, this is precisely what many people don't understand and what the guy who opened this thread did not understand. He thought Mint is violating the GPL because it is shipping MP3 and DVD codecs and such ... which is total BS and just proves he got himself agitated over something he did not even know anything about. Remember that the GPL only places restrictions on distribution, not use. So it will always be okay to install and use proprietary kernel modules. So regardless of how the Nvidia driver works, it will always be okay for the end-user to install and use it. TwistedLincoln wrote: So it will always be okay to install and use proprietary kernel modules. So regardless of how the Nvidia driver works, it will always be okay for the end-user to install and use it. I read somewhere online (no idea where, I do entirely too much reading) that developers where thinking of putting code into the kernel to prevent such programs from connecting. That would mean that I could not get drivers for my cards unless they were approved by those developers, which I'm sure would involve some sort of fee somewhere even if it was paid by the driver builder and added into the price. If I misunderstood, it wouldn't be the first time. scorp123 wrote: You are wrong. There is a perfectly legal patent on the wheel which is even still valid! Not to pick nits, but it's only "legal" because it has yet to be challenged. It definitely proves the patent system is a joke. Is it possible to write a script that could figure out the inner workings of a device and write a driver for it? You could patent that and make a fortune! Mint is not Ubuntu restringed...its Ubuntus next step..know it. clap clap clap clap Amen for clem's posts !!! It would be very nice, you respect the ambient and the good manners of this forum. Sasquatch wrote: I read somewhere online (no idea where, I do entirely too much reading) that developers where thinking of putting code into the kernel to prevent such programs from connecting. Not true!!! Those drivers would simply be blocked. End of the story. You cannot buy "portions" of the Linux kernel from anyone. And that's exactly what you suggest here. This is simply not possible. Sasquatch wrote: which I'm sure would involve some sort of fee somewhere even if it was paid by the driver builder and added into the price. scorp123 wrote: If I misunderstood, it wouldn't be the first time. scorp123 wrote: Is it possible to write a script that could figure out the inner workings of a device and write a driver for it? You could patent that and make a fortune!